My daughter had headaches since the age of 11 years. Now 14 years later (at the age of 25) she has been diagnosed with an arteriovenous malformation (AVM). She has extremely low blood pressure. Her doctor finally diagnosed the problem in 2017 and her AVM was 7.1 in size in the middle of her brain. Over the course of the past year she has had coiling with radiation following the coiling and her AVM is now at a 4.1. She now suffers from memory loss, loss of peripheral vision and has blackout spells. She must have the AVM removed from her brain, but she has been told that she cannot have that done until the AVM shrinks to 2.0 or lower. I was diagnosed in 2004, at the age 44. I had high blood pressure, groin stiffness, painful rib cage, and lower back pain. My doctor ordered an MRI, and it was discovered I had arteriovenous malformation (AVM). At the time, I was in the process of moving from Philadelphia to Texas. The neurosurgeon that was treating me said he could resolve it by injecting some type of glue in my spine to dissolve the mass of twisted veins that were residing in my spinal column. I told him that I would have the procedure done once I got to Dallas. Fourteen years later, I'm back in Philadelphia, and still trying to get the surgery done. Now, my condition has extremely worsened. I have extreme nerve pain on the left side of my back wrapping around my ribcage area to my stomach, as if I was being shocked all day with a Taser. I can barely walk when I get out of bed, or in a seated position. Both legs below my knees are numb and my feet and toes feel as if I have a case of frostbite. The left side of my lower back, feels like I have a slipped disc in my lumbar, but an MRI proved that I don't. Walking is becoming a painful chore. The Veterans Affairs Hospital has scheduled me for an angiogram that I have been requesting now since 2004. I'm constantly living in pain, hoping for a miracle surgery to happen. I could not talk like I used to do when I went to work. It got worse later. Blood pressure was high. I went to the hospital for CT, then MRI and was diagnosed with arteriovenous malformation. My husband was diagnosed 2 years ago with an arteriovenous malformation (AVM). I began to notice subtle changes in his personality and he went from somebody who would go power walking every evening to suddenly only being able to walk really slowly. I brought him to the general physician who sent him straight to the Accident and Emergency department and he was diagnosed within a couple of hours as having an AVM. He underwent embolization on same and during this procedure had a massive hemorrhage. They then removed the AVM under emergency surgery. He spent many months in hospital and rehabilitation but still has many neurological deficits which I believe were caused by the AVM itself. I fell and when I tried to sit up I could not and kept falling over. I did get myself up and then started laughing. It did not take my husband long to know I needed to go to emergency room (ER) and the ER doctor said he thought I was having a stroke. He ordered CT and then MRI which showed arteriovenous malformation (AVM) and I was told this was nothing because it was venous and the symptom I had was in the back of my brain. This AVM was in the right temple. This happened in 2013, then in 2014 I went down again and I am still having trouble with my balance. At age of 20 in the Air Force I was found to have an arteriovenous malformation (AVM). I went in for surgery on the left side of my brain. I suffered headaches for years afterwards. Approximately 18 years ago pain in my head kept me in bed for a year, I went to several clinics with no relief, just slowly got back on my feet again. Military had given me 10 percent disability. I had tinnitus and was then diagnosed with arteriovenous fistula grade I malformation. Once I had the diagnostic procedure my tinnitus disappeared. An arteriovenous malformation (AVM) in the right frontal lobe was found after I passed out and when I tried to sit up the room started to spin and I started laughing. The emergency room doctor felt I had a stroke in the back of my brain as I am unable to maintain my balance, instead they found the AVM and I have since passed out and have balance issue. No one feels it is caused by the AVM; for years I had migraines. I had a headache my whole life. In 1995 I felt the most violent intense pain of my life, it felt like someone came up behind me and hit me with a two-by-four. The pain took me to the ground. We were 2 hours from home, and I had the most painful drive of my life. I could not talk, and every single movement increased my pain. I insisted my husband take me home, took pain pills and went to bed! I thought it was a migraine which I had never experienced and knew that they were severe. It took 3 months, and 5 MRIs, numerous drugs, doctors, and frustration trying to get diagnosed! Finally, one neurologist had the dye injected into my groin, and he saw the arteriovenous malformation and where my bleed was! He performed surgery to remove tightly twisted blood vessels, size of my thumb, in my right ventricle, very center of the brain. The surgery left me with equilibrium/balance issues, and my entire left side of my body is wracked with 24/7, chronic severe nerve pain, that I cannot be 1 minute without thinking about the pain; it's exhausting, and I cannot sleep. I also have fibromyalgia and chronic fatigue syndrome. I am on medical leave from my job right now, due to the severity since 12/5/14. I experienced double vision and went to have my eyes examined. I was sent to a neurologist. By this time I was hearing a swooshing noise in my ear and my left eye started to grossly protrude. I then was referred to another neurologist who determined I had an arteriovenous malformation (AVM). He would try an embolization. The first one did not work. I had another try and it did not either until the next day. My double vision disappeared and my eye went back to normal. I was 48, collapsed, and diagnosed with arteriovenous malformation (AVM) with bleed. It was coiled, with surgery. Thinking back to headaches that were treated with Midrin, Toradol, etc. As a nurse, I refused narcotics. No CT was ever ordered so until hemorrhage no one knew. Symptoms along the way were auditory hallucinations until puberty extremely rare afterwards, and loss of knowledgeable consciousness, (I would drive for miles without knowing why, how, where I was). Multiple times I was treated with anti-depressants, still no CT. Onset of severe back pain/headache was treated with narcotics and anti-inflammatories, hospitalized but no CT. No history of hypertension, actually had hypotension most of my life. Finally on duty in my emergency room (ER) and collapsed after feeling a popping sensation, flown fixed wing air. Coiling and removal was a week later as a now or never procedure as I continued to bleed and pressures were bad. Fourteen years later I have some short term memory issues, amnesia to the event and several months' time period, loss of feeling entire right side of body, stuttering when emotional, anger, seizures controlled by Dilantin at this time, and loss of knowledge of hunger which has caused real issues with inability to lose weight which I gained early on. I was hospitalized for video of seizures. Being placed on severe caloric intake for 2 weeks resulted in 14 lb. weight gain. It's not fluid as per doctors… so I remain the enigma; ok but I live. I kept battling migraines for almost 1 year. Last month l went to my primary care physician to deal with a migraine. After performing the neurological tests he informed me l needed a CAT scan. Prior to this l experienced headaches on the left side of my head, dizziness, nausea, stiff neck, and extremely high blood pressure. 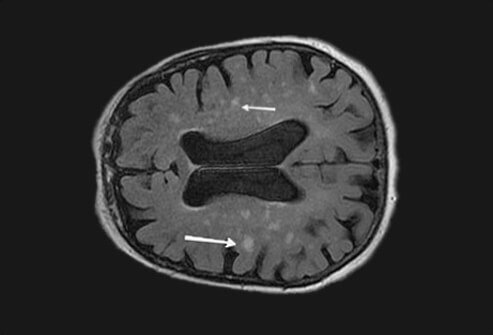 The CAT scan revealed the suspicion of arteriovenous malformation (AVM) and the MRI showed the AVM. I have had two bleeds. My first in 1973 and the second in late 1989. In both cases the symptoms were a sudden and intense pain in my head. I heard one description of this as "place your thumb on a concrete block then hit it with the heaviest sledgehammer you can find. Repeat." This is a very accurate description. After being rushed to the hospital, it was discovered by injecting dye into my bloodstream while taking x-rays. That was 1973. CT scans are so much nicer, done in 1989. After the second I had it surgically removed. Good riddance. I kept hearing my heart rate in the left ear. It would wax and wane, but not too sure if this related to my blood pressure control. I am told that one cause may be an arteriovenous malformation.